White’s argument is valid with respect to China’s impressive economic and military rise over the last three decades, which brings it greater respect and influence in regional affairs. However, whether China should enjoy a greater regional status rests not only on its growing power, but also its moral authority and regional acceptance. The region’s future peace and stability, therefore, is not determined by whether the US forgoes its primacy or not, but primarily by how China behaves to prove it deserves such a concession from the US. American accommodation of China’s rise doesn’t guarantee that regional peace and order will be preserved. Similarly, its containment of China doesn’t necessarily imply a grim prospect for regional peace. Various historical precedents can provide a firm basis for such a judgment. For example, the appeasement of Hitler could not prevent the Second World War, while the US-led containment of the Soviet Union played a significant role in maintaining peace between the two superpowers and global order during the Cold War. China’s real intentions are an essential element to judge whether the US relinquishment of its primacy is beneficial or detrimental to regional peace. However, it’s almost impossible to gauge China’s real intentions given its opaque decision making procedure, the obscurity around its military modernisation program, and the authoritarian nature of its political regime. Although China consistently promotes the rhetoric of its ‘peaceful rise’, its recent growing assertiveness in territorial and maritime disputes with its neighbors casts doubt on that. In addition, China has failed to convince regional countries that it deserves at least a greater role, let alone a ‘Chimerican’ co-leadership in the regional order as White has suggested. For a rising power to win a greater role in international politics, it should be able to generate a moral authority to attract friends and especially allies. Such a moral authority is first and foremost derived from the constructive and exemplary role it plays in the region, as well as its willingness to play by established rules and norms. China, however, has failed to generate such a moral authority. For example, its claims based on the U-shaped line in the South China Sea has defied all relevant maritime legal rules, causing regional countries to perceive China as an expansionist power rather than a constructive, peace-loving one. Due to China’s lack of moral authority, regional countries aren’t yet ready to accept its leadership role in the region. Following the US announcement of its strategic rebalancing toward East Asia—widely perceived as emerging US containment against China—regional countries tended to welcome rather than denounce America’s move. Across the region, it’s almost impossible to find a true ally of China which is sympathetic to its bid for regional leadership. Instead, regional countries, including Japan, the Philippines, Vietnam, Australia, Singapore and India, all have taken steps that could be interpreted as moves to counter China’s growing power. Finally, there’s no certainty that China will keep growing economically and militarily the way it has over the last three decades. Recent signs of a possible economic recession in China, coupled with its unsustainable growth model, cause observers to be much more conservative than before about China’s long-term economic prospect, and thus the likelihood of its ultimate rise as a true challenger of the US primacy. So while White’s argument has a solid basis, it may still be premature to argue that the US should forgo its primacy to accommodate China’s rise as a regional leader. There are still many things China needs to do to gain the moral authority and the international respect that make its regional leadership acceptable to both the US and regional countries. For example, it should make its military modernisation program more transparent, and bring its territorial and maritime claims into conformity with international law. Its drop of the nine-dashed line claim in the South China Sea, in particular, would be a very meaningful move toward this end. In the long run, an improved human rights record as well as its transition toward political democratisation would further contribute to wider acceptance of its regional leadership role. In the meantime, as has been the case over the last six decades, the US unchallenged primacy in the Asia-Pacific region should continue to provide a firm foundation for its peace and stability. The rise of China will challenge that foundation. But the region’s future peace and stability won’t be decided by the US perception of and attitudes toward China’s rise, but by China’s behaviour and the resulting effects. It’s China, not the US, that holds the key to the future of the region and of its own. Le Hong Hiep is a lecturer at the Faculty of International Relations, Vietnam National University, Ho Chi Minh City, and is a PhD candidate at the University of New South Wales, Australian Defence Force Academy, Canberra. 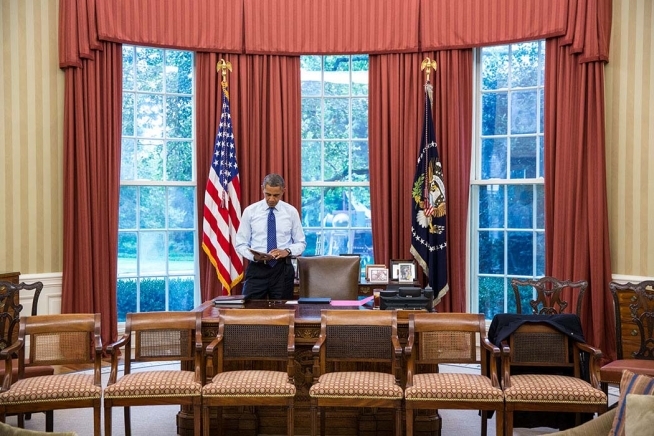 Image courtesy of The White House.